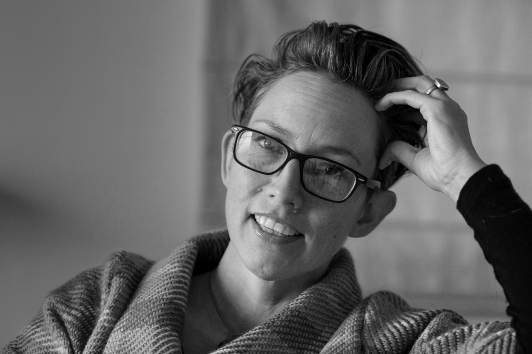 Hinemoana Baker is the 2014 Writer in Residence at Victoria University of Wellington. She is a poet, musician and playwright. In 2002, Hinemoana completed the MA in Creative Writing at the IIML. She has three collections of poetry, matuhi / needle (2004), koiwi koiwi / bone bone(2010), and waha / mouth (2014), all published by Victoria University Press. In 2009, Hinemoana was appointed the Arts Queensland Poet in Residence, and in 2010 she was one of the writers in residence at the University of Iowa International Writing Programme. I first encountered Hinemoana’s poetry as an undergraduate in the United States, while co-editing a feature on New Zealand poetry for Shenandoah: The Washington and Lee University Review. We selected Hinemoana’s poem ‘Rope,’ also chosen for Best New Zealand Poems 2013. Since then I’ve passed Hinemoana on the narrow stairs of 16 Waiteata Road, heard her at poetry readings, including a stirring Writers on Monday session at Te Papa, and encountered her through her lyric creations. This interview was conducted over email, in several batches of questions, during the week of 24 November 2014. We’ve bumped into each other on a few occasions at the IIML late at night. Do you like writing at night? Is there are particular time of day that best suits your writing habits? It’s not so much that I like writing at night. In fact, it’s not as if I ‘like’ writing at all, to be honest. It’s more something I feel driven to do, then I feel fantastic once I’ve done it. There’s probably a gory physiological analogy floating about somewhere, but I’ll stop reaching for it. (This is a family publication, right?) I work at night because when I had a proper job, way back in 2013, I worked afternoons and evenings, so I figured I’d just keep going with that biorhythm. It means I do all of my fun stuff in the mornings, like walking the dog and grocery shopping and signing autographs, then I get to the office anywhere between 2pm and 4pm, and work until anywhere from 9pm to midnight. It seems to work ok. It just means I don’t get much of a social life during the week, and I miss out on all the good TV series that my flatmates follow. Have you watched ‘Happy Valley’, Max? It’s bloody good. Not moaning though. I also get the sunshine! On those days when it’s sunny. I’m looking at you, Wellington. I remember one poem of yours in Waha, ‘Manifesto,’ where you compare poetry writing to taking care of a dog. Can you expand on that idea? The poem ‘Manifesto’ came about as the result of an exercise set by Nick Twemlow during a masterclass I did with him online via Iowa University. Nick tutored the Iowa Programme here at the IIML one summer. Anyway, the idea of writing a manifesto for writing was something I’d never considered before. At the time I was a new dog-owner (not quite the crazy dog-lady I am today) and feeling overwhelmed by the many ways in which this young canine was changing my life and my daily routines. There was a lot more to raising a dog than I had ever imagined. So I did what I often do, which is to write about one subject, then defamiliarise it by framing it under another kaupapa or title. I did the same thing with a poem called ‘A Walk With Your Father’, which is ostensibly about strolling along with your dad and talking about the hard questions, but isn’t, but is. And scuba-diving. Sort of. I’d be interested to know more about the Writer in Residence experience. Being paid to write – especially without the rigour of academic coursework, workshops, etc. – seems to put a weird kind of pressure on a writer. Also, Writer in Residence seems to be an odd limbo position that’s not quite staff and not quite student. You did the MA at the IIML, and have taught writing before – how does this position compare? I guess if I say anything else here except ‘Oh my god it’s been such an incredible opportunity and what a privilege and I can’t believe my good fortune’ I’ll sound like some kind of ungrateful weirdo, right? Ha! The truth is a bit of both – the pressure is definitely there, and the voices of self-doubt have been loud at times this year, for sure. But I think that has had more to do with the fact that I’m writing in a completely different form than I usually do. Having done the MA here in 2002, to an extent it’s all felt like coming home. I’ve loved getting to know this year’s students and their work. It’s brought back all the memories…shout outs to the class of ’02! The main differences between anything I’ve ever done before – i.e. teaching, studying, etc. – and this year are to do with time and freedom. I am not answerable to anyone except myself creatively, and I’m only marginally answerable to the IIML and VUW professionally. I’ve refrained from extremes of bad behaviour in both arenas. Well, so far. (I guess there’s still time.) The hardest part of this set-up is that I’ve had to be my own boss, manager and cheerleading squad. I’m kind of used to this, having been a self-employed contractor for the last 20 years or so. But there have been days when I’ve thought fondly of my old day-job, and how I would swipe in at the beginning of a shift and know exactly what was expected of me for the next 7.5 hours. It’s not really like that, writing. On the up side…well, do I really have to elaborate on the up side? I’ll probably just make everyone feel a little bit ill, right? During your time as Writer in Residence at the IIML, can you tell us about what sort of project you are working on? My intention this year has been to somehow write two family stories that I’ve been trying to ‘set down’ for a long time. One is my own story of infertility and involuntary childlessness. The other is about my father spending a few fairly traumatic years in the 1940s/50s, along with his four brothers, in a Catholic boys’ home in Nelson. At the beginning of the year I had no idea how I would tell these stories together, or whether they wanted to be told together at all. I feel more certain about this now. I spent a month in Nelson in May, and as part of that trip I stayed for a few nights at what was the orphanage, Sunnybank – now known as Garindale Estate. The local newspaper wrote a feature article about my visit. Since then, as a result of the article, I have been approached by many Sunnybank survivors, each with his own stories of the place. It has made me think a lot about burial – literal and otherwise. I knew the details would be far from pretty when I started this research, but I think it’s fair to say I wasn’t prepared for some of the twists it’s taken. A few of those approaching me have unequivocally good memories of the place. Most – including my father – don’t. I’m a poet, not an historian. My usual process, which is akin to that of a visual collage artist, is to gather a lot of raw material in all sorts of different formats – scribbled dreams and nightmares, anecdotes from interviewees, voice memos recorded on my phone, photographs, original source materials, family mythologies. I then translate the non-text things into a kind of stream-of-consciousness writing. When I’ve amassed a good bunch of language I select and harvest from it, and bung those chosen chunks together in fresh combinations. This is the approach I take when writing poems, and even short stories or essays. I wasn’t sure it would work for a longer work of prose. But it seems it does. At least, at this point (two months to go!) I’m quietly optimistic. There has been a lot of talk in our workshop about the fiction/non-fiction divide, especially as it relates to memoir or family narrative. In the process of writing something based in historical fact, how tied do you feel to the ‘truth’? Do you feel free to invent details or do you only include information you can verify? This question makes me queasy. I do not have any answers. I am struggling every day with these things and so I spend most of every day queasy. I will let you know how I fare with answering these questions when the manuscript is finished, in a year or so. For now I can say that for this first draft, I am writing my book as if no one is ever going to read it, even me. This is on the advice of Chris Price, and many others. In fact, I am writing it as if we are all going to be wiped off the earth by some catastrophe or other the moment after I type the last full stop. It’s the best way for me to trick myself into carrying on, at this point. All that said, I have found a form that’s working for me at the moment. I’m writing the book as letters. There is a strong whakapapa for letter-writing in the Māori world – ever since the advent of writing here in Aotearoa. I’ve been fascinated to find out a bit about this through meeting Dr Arini Loader, whose doctorate investigates the proliferation of 19th-century Māori writing, including but not limited to letters, specifically from a Raukawa and Toa Rangatira perspective. Another topic we’ve discussed in workshop, which might relate to your current project, is the use of sentimentality in literature. Do you think it is bad to lapse ‘sentimental’ when discussing a personal story? How can a writer maintain emotional integrity without going overboard? In terms of form – how are you getting on with the move from poetry to prose? As someone who’s mainly worked with the lyric form, what is it like writing all the way to the right-hand margin? Well, this is all fairly new territory to me, Max. I do write about personal things when I write poetry, but something about the form enables me to move in and out of meaning, playing with both the oblique and the blindingly clear things language can do. I’m still working out how to achieve the same kind of texture in this long work of prose that I am referring to currently as My Miserable Memoir. I’ve been reading a lot to try and get some ideas of how other people do it. Kathleen Finneran’s The Tender Land patchworks its paragraphs with different timeframes, sentence styles, dialogue and non-dialogue, repetitions and surprises. The result is a very satisfying kind of irregularity, sometimes even a jaggedness, that resembles my favourite kinds of poetry. Alan Loney’s The Falling is a beautifully contemplative memoir written as letters between the author and a friend of his who died as a young boy in the Tangiwai Rail disaster of Christmas Eve 1953. It plays with its timescale and insists the reader slow right down to appreciate the frame-by-frame action of the event itself, as well as the tangents and drifts of the author’s thinking and attention. If anything I write this year approaches the sophistication and courage of either of these books I would be most thrilled. As far as the right-hand margin is concerned, we have met before. We have encountered each other, Max, the right-hand margin and me. I’ve written a few essays, some short stories, a play or two (not sure if that counts, though). Emails, too, of course, much like this one. I’ve never spent quite so long in its company, though, I must say. The hardest part of the whole thing for me has been that the emotional territory of this book is fairly dark, most of the time. So if I want to write it well, I have to be prepared to open up to that for several hours a day. Hang out there wholeheartedly. It takes me a couple of hours to stalk towards that place, and a couple of hours to climb back out afterwards. It’s not a tidy process. Some of it involves lying on the floor, hugging my (alleged) dog. I do the same when I write poems, usually, but with poems I can do it once a week, or once a fortnight, and get a good poem out of it. At the moment I’m doing it every day. But it’s working. I’m getting there. And in a year I’m going to have some really fantastic happy feelings about having finished. And, if you can say without giving away too much, how do you manage to weave those two stories (your own personal story, and your father’s childhood story) together? At first I was preoccupied with *not* letting the insensitive clichés step into this process. I didn’t want, for example, to imply even for a moment that it was anything to do with ‘wanted’ children and ‘unwanted’ children. So far, the two stories seem to be organically stepping in and out of each other’s way. I’m just concentrating on letting the language lead me, much as I do with poetry. It usually proves to be a lot wiser than I am. Thanks again! I like how I’m personally addressed in some of these answers. I think this will be the last batch! Hmmm…your name. Yes. I could say it’s to do with the fact that I know you as a friend and fellow writer, not just a faceless online interviewer. I could also say that I like to offer a personal touch in a sometimes cold, virtual environment. But mainly I think it’s just that I really love your name! Seriously. Max is a great name. I’ve noticed your poetry often has a political awareness, such as in your poem, ‘Methods of assessing the likely presence of a terrorist threat in a remote indigenous community,’ and I was wondering if you could speak about the place of the poem, or poet, in a political context? Also, does your current project have any political resonances and, if so, could you speak to those? I have to disagree with you slightly, here. I don’t know that very much of my poetry does have a political awareness, beyond the fact that I make no bones about writing as the person (and citizen) that I am: mixed race Māori/Pākehā, middle-aged, queer/takatāpui, mental illness, woman. The poem you mention is one that you could say is more explicitly political, but I didn’t write it as a political response to political events. I wrote that poem because I felt furious about how my friends were being treated by the state and the media. I wrote it because I was outraged about the state surveillance involved. It felt like a very personal response. I still think it’s a bit oblique and odd for most people’s tastes, but it somehow gave vent, and some kind of language, to the white hot rage I was feeling at the time. I remember when I was just starting out as a musician, someone gave one of my CDs to the programme director of the local Māori radio station and said my stuff was good, they should play it. They asked if I was Māori, and were told yes. Then they asked, ‘Yeh, but what’s her kaupapa?’ Meaning, I suppose, was I the right kind of Māori, was I enough of an activist…? What were my politics…? I’m not sure what the answer was, or whether they played my CD, but I thought it was an interesting question. I have very clear ideas of what my politics are, but I’m not very good at putting them into my poems in ways that do the poems or the politics any justice. I’m insanely jealous of those who can. I’m thinking here of Tusiata Avia (‘Ifoga’), and Bill Manhire (‘Hotel Emergencies’), and Anne Kennedy (‘I was a feminist in the eighties’), and Robert Sullivan (‘Waka 99’) and all the poets we published in Kaupapa: New Zealand Poets, World Issues (sadly sold out now). You write that you are ‘writing the book as letters’, and I was wondering if that changes the idea of audience for you in this piece of writing. Are you usually writing to an audience and, if so, to whom? I usually don’t need any kind of imaginary reader or audience when I’m writing poems. But I’ve found it very important in this current project to be writing ‘to’ someone. It’s turned out that the someone in this case is a long-dead nun, and the reader gets to steam open the letters. I was having a very hard time with producing text at all until I touched on the letters idea. Finally, to follow up on an earlier question – you said as Writer in Residence, you are your own ‘boss, manager and cheerleading squad’. I was wondering if you also have a community of other writers you might ask for advice or to read drafts? Have you maintained any remnants of the workshop process after leaving the MA or do you write mostly on your own? Of course, and thank you for reminding me, because I was going to add this in to my previous answer, I have many, many wonderful supporters, friends and family who listen to my crazed writerly rantings whenever I need them. Many of them are artists themselves, and having them around to discuss the process of making is invaluable. And while I tend to write alone most of the time, I have also had a very busy office while I have been here. I like to feel like I have company, at least for some of the day. So there are several friends I do shared write-ins with during an average week. We get together wherever we can and just sit for an hour and write. Sometimes it’s on a park-bench in the local dog exercise area. Sometimes in my office. Often in Milk and Honey, the cafe on campus. I also have several friends who don’t live locally, but we write together nevertheless. One of them lives in Christchurch, and sometimes we arrange things by text, and sit in our separate cities at the same time and write. It helps me a lot, writing alongside other people.